With a Side of Chocolate: Organization: Closet. I mentioned Monday that I'm working to become more blog organized so that I spend more time doing the parts of blogging I love and I don't waste the time staring at this blank space trying to scramble to write a post that I don't really like but just wanted to hit "publish". Danae commented that she's trying to get more organized in real and blog life and I realized I needed to do a little more of life organizing as well! So the first task I'm taking on is our apartment. 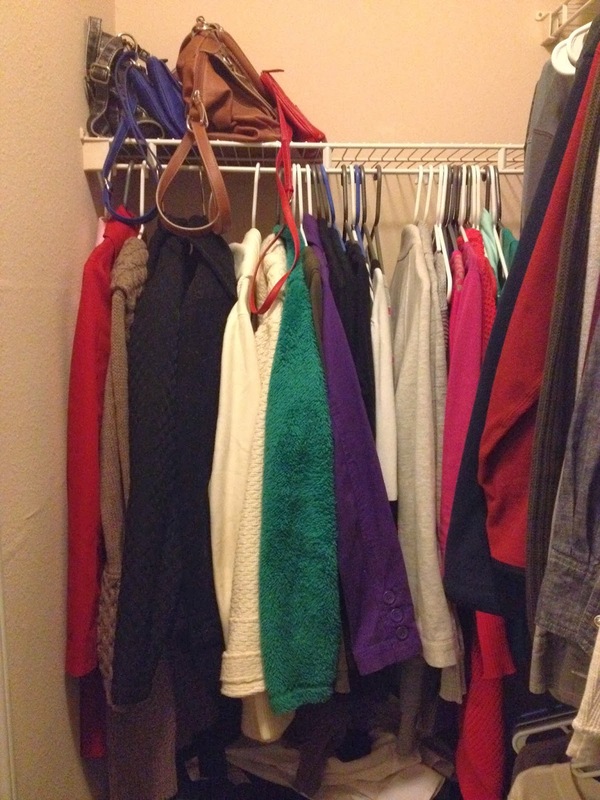 We don't have a lot of storage - just our closet, a linen closet and teeny coat closet. We do have a GIANT garage but we're scared of filling it up and having nowhere for those things to go if we move somewhere similar in size, but without the garage. So right now, all that's out there is our Christmas decorations and a few things I haven't ever unpacked... Oops. I plan to document this organization process here on the blog, but today I'm starting with something that's already organized - our closet! I'm so so serious about my clothes organization and having to merge with a boy was quite an adventure but after a solid hour or two shortly after we moved in, I had it set up pretty well. After Christmas, I was able to do some more organizing as well since I donated some clothes, had some scarf hangers from Christian's parents and there were no more Christmas presents in the closet. 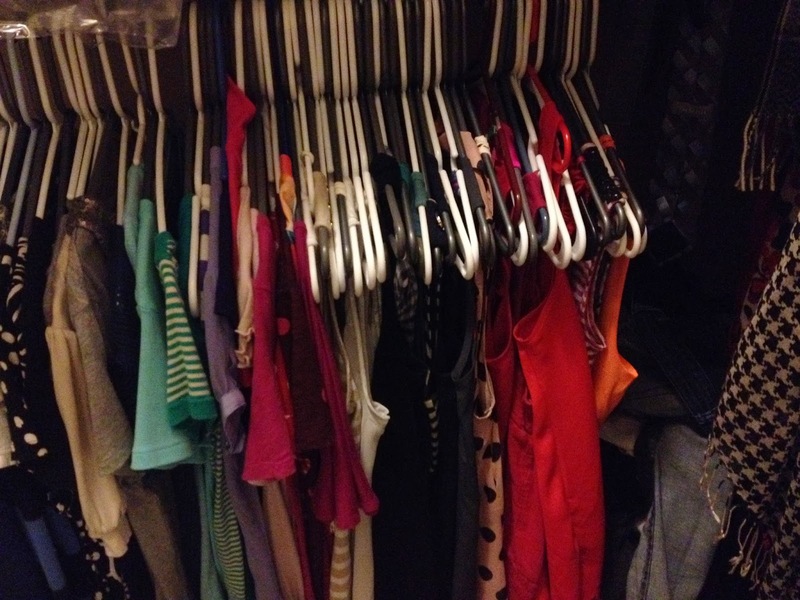 So here we go.. How I Organize Our Closet! All of my hangers/clothes have to be facing the same way. Christian puts his backwards and it drives me absolutely. in. sane. 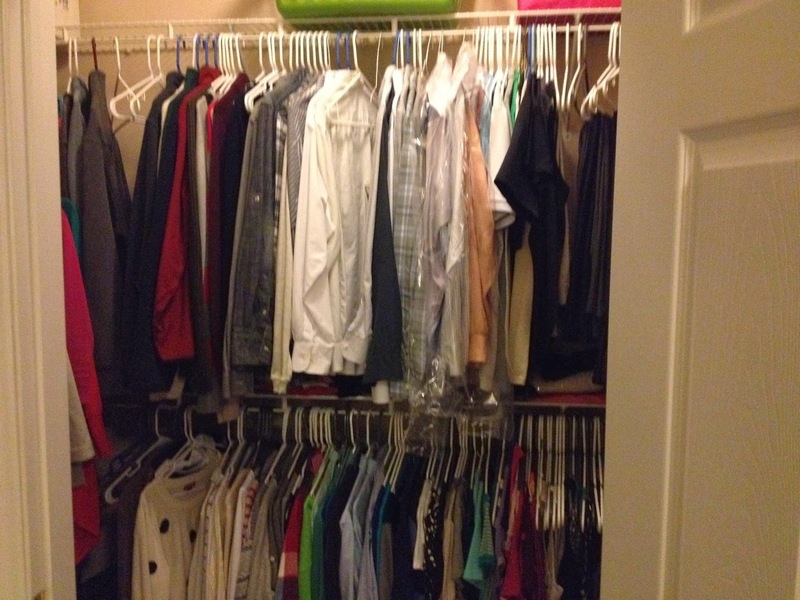 So I slowly turn all of his around ;) I also tryyyy to use the same ones in the entire closet, but right now I do have a few that are the wrong color but there's no use in spending money for hangers you already have but just don't like so I'm sucking it up right now. 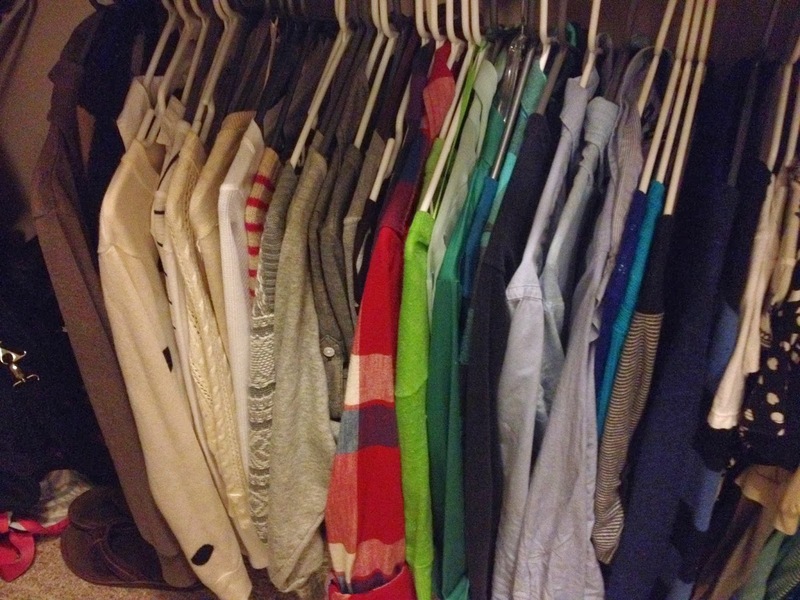 I organized my clothes by season and color. On the far right, I have long sleeves followed by short and then sleeveless. Then of course, they organized by color group, as well. Grays, blacks, whites, pinks, oranges, etc. I also take the bottom row because I can't really reach the top row! I originally organized Christian's row with sweaters, works shirts, Polos, and "weekend shirts" but he's just destroyed that method! On the right side of the closet, I have my favorite articles of clothing: dresses and scarves. AKA my weakness. I have too many to count of both, but I honestly wear the vast majority of them! The dresses are also color coordinated, of course. On the left side, I've got all my coats and cardigans! Again, by color. What can I say? 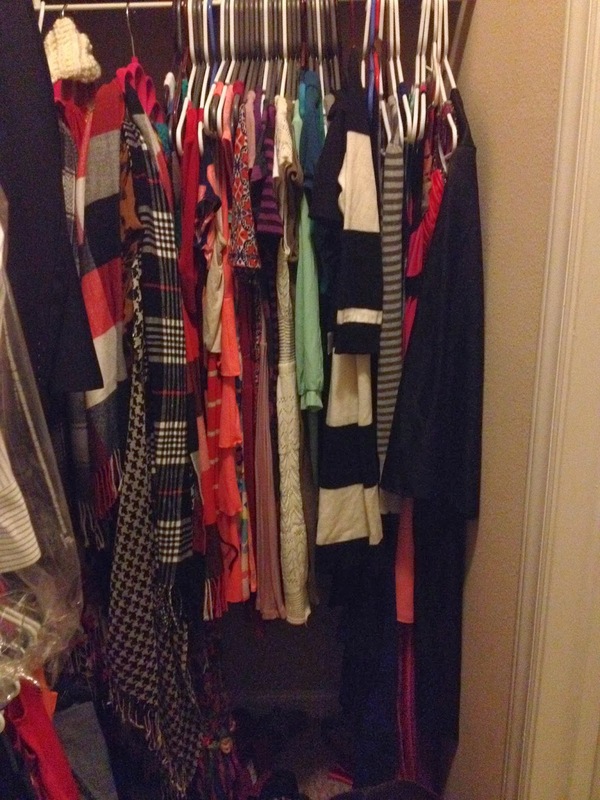 I'm a closet neat freak! All of the majority of my shoes are under my dresses in the closet. Heels/summer shoes in back with my most worn flats and boots in the front. Christian literally has like.. 5 pairs of shoes so his are under my cardigans. We have the clothes hamper in the back corner of the closet so it's soooort of hidden and Christian also has a little 3 drawer organizer where Christian keeps his workout clothes, ratty tees, boxers, socks oh and engagement rings. My purses also go on the top shelf over my cardigans. And the very, very top shelf that I can't reach has a couple things stored that we don't use too much! Throughout the week, the closet can get a little unorganized so I make sure to straighten it up every Friday or Saturday when I'm home. I'm a freak - I know. Please tell me at least a couple of you are sticklers in the closet too?? Looking fabulous! You know I love it! Ahh I love an organized closet! 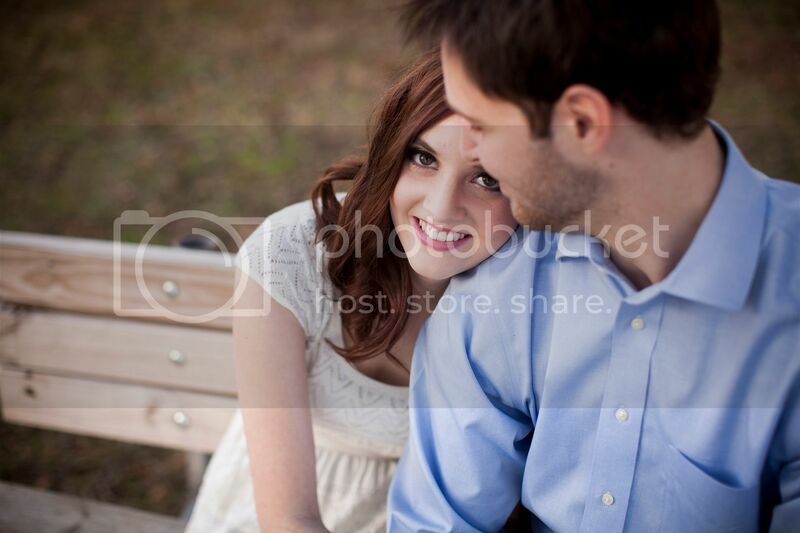 I did ours by color and type too and it makes it so much easier to find what we need! I love an organized closet!! One time my roommates were helping me unpack from break and hanging up my clothes. They didn't realize I had an order/process and were totally baffled when I tried to explain it haha a. I'm glad I'm not alone in this!! I'm the exact same way!! Every year when I move in to school my suitemates see the closet and think I'm a freak- I think they're jealous!